My review: When Doon and Lina were both assigned jobs in Ember that neither of them wanted, they switched. Simple as that. Now, each is trying to master their new jobs while struggling with the ever-increasing blackouts that plague Ember. When the lights die, there is no other light. Their entire world is dark. Doon feels he must do something and is trying to desperately find a way out of the city and beyond the darkness. Lina becomes his ally, and is increasingly worried for her family and by the strange messages that are being passed around the city. When Lina and Doon receive an vital piece of information that seems to hint at a way out of Ember, they embark on an adventure to save the city, and themselves before the lights go out forever. When I first read this book, several years ago, I was immediately (and pleasantly) reminded of The Giver. I think it was the concept of a mysterious "community" and job assignments. Anyway, I was afraid that it was going to turn into a knock-off, but was pleasantly surprised by how the author worked it all out. I loved how this book held mysteries but allowed the reader to try to figure out clues before Lina and Doon are able to. When the characters encountered objects they had never seen before and described them with new eyes, it was fun to be able to guess what they were and then wait in anticipation until Lina and Doon figured it out. I truly enjoyed this book and feel that it is appropriate for all ages. I think that kids will be attracted to the adventure and mystery of it all and will feel as if they are part of the adventure. The ending allows for closure, but really hooks you into reading the next book, The People of Sparks. 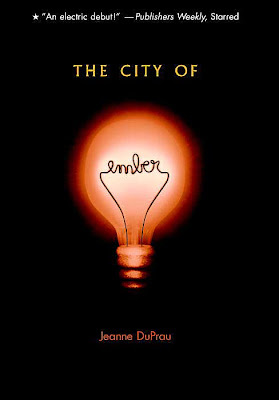 I have recommended this book to many adults who have really liked it and even asked to borrow the rest of the books in the series (to be read, no matter what anyone else says, in this order): The City of Ember, The People of Sparks, The Prophet of Yonwood, The Diamond of Darkhold. Sum it up: A fun, clever, and adventurous read for boys and girls alike.